February and March are a tough time for plants; the heat of summer has killed off annual grasses, and few native plants are in flower. It is at this time that, almost miraculously, the flowers of the Calostemma purpureum (garland lily, purple bells) emerge from the hard and parched ground, a cluster of purplish-pink flowers at the end of a fleshy stalk — and not a leaf to be seen. This species has been chosen as this month’s Plant of the Month: it is a native bulbous herb of grassland and open woodland habitat that features prominently in the current Park of the Month, Shepherds Hill Recreation Park. When encountered for the first time, Calostemma is often mistakenly thought to be an introduced plant: its robust and succulent appearance simply does not fit the stereotype of a native. In many features it resembles a smaller version of the garden plant belladonna lily (Amaryllis belladonna) and is in fact a member of the same family (Amaryllidaceae). However, Calostemma is uniquely Australian and confined to the eastern part of this continent. 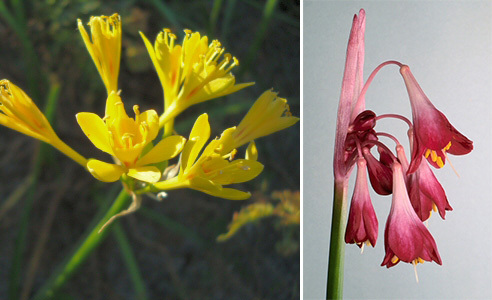 Although their initial appearance is usually triggered by a fall of rain, their flowering and growth is sustained by a bulb about the same size as that of a daffodil. The bulbs are buried deep, as much as 30 cm below the ground, having been pulled down a little further each year by contractile roots. By the end of summer each mature bulb is primed with three almost fully developed flower stalk buds awaiting the signal to expand as soon as some rain arrives. These plants have reversed the usual cycle of a spring flowering after winter vegetative growth prevalent in Mediterranean climates. Instead, Calostemma behaves like a number of other autumn flowering species where flowers first appear on their own, with the leaves to follow later. Calostemma remains in its vegetative growth phase through winter and spring when conditions are much more favourable, until eventually the fleshy strap like leaves die back again for summer. One of the most fascinating aspects of the garland lily’s ecology concerns its seeds, strictly ‘pseudoseeds’, which behave as bulbils. These are green, water-rich, fleshy but firm and similar in appearance to a large pea. The fruit itself is reduced to a mere papery shell surrounding the seed. 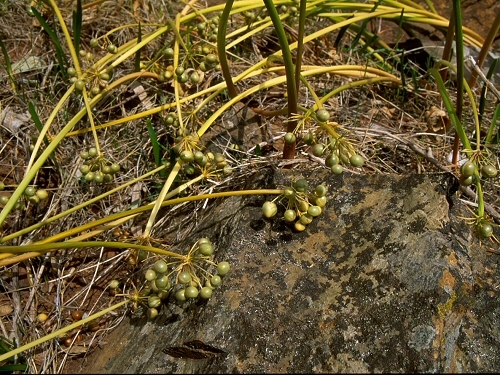 The flowering stems dehydrate as the fruits swell, leaning over under their growing load. 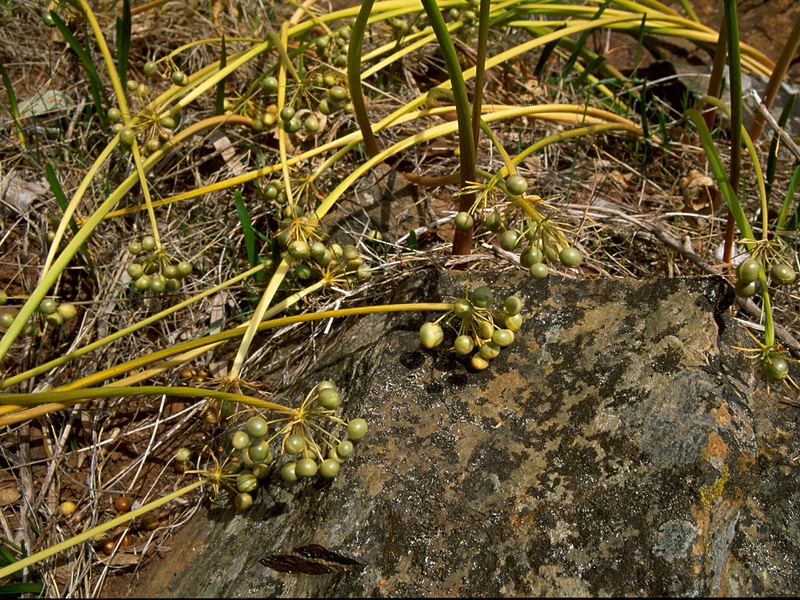 Soon the stems become prostrate and release the fruits, so dispersing them by a radius equivalent to their height. This limited reach is enhanced by the ability of the seeds to roll down-slope, to float in water, and perhaps sometimes to be carried and dropped by birds. Perhaps the most remarkable feature of these propagules is their lack of dormancy. They start to ‘germinate’ as soon as they are mature and do so without water, drawing on the moisture contained within them. The cotyledon with root and shoot sometimes even emerge while it is still attached to the plant. Calostemma was first described by Robert Brown in 1810. The name is derived from the Greek καλός [calos], beautiful, and στέμμα [stemma], garland or crown, which refers to the conspicuous golden corona in the centre of the flower formed by the fusion of the six stamens. Calostemma purpureum often grows in dense colonies, and can create a mass of pink when in full flower. Flower colour on individual plants varies from a purplish maroon to pale pink and occasionally white. The genus has two other species, both found in South Australia. The slightly larger yellow-flowered Calostemma luteum (yellow garland-lilly) occurs in the Riverland and Lake Eyre drainage systems. The aptly named Calostemma abdicatum (the epithet is from the Latin abdico to disown, renounce or resign) is remarkable in lacking the definitive corona, from which the genus takes its name. 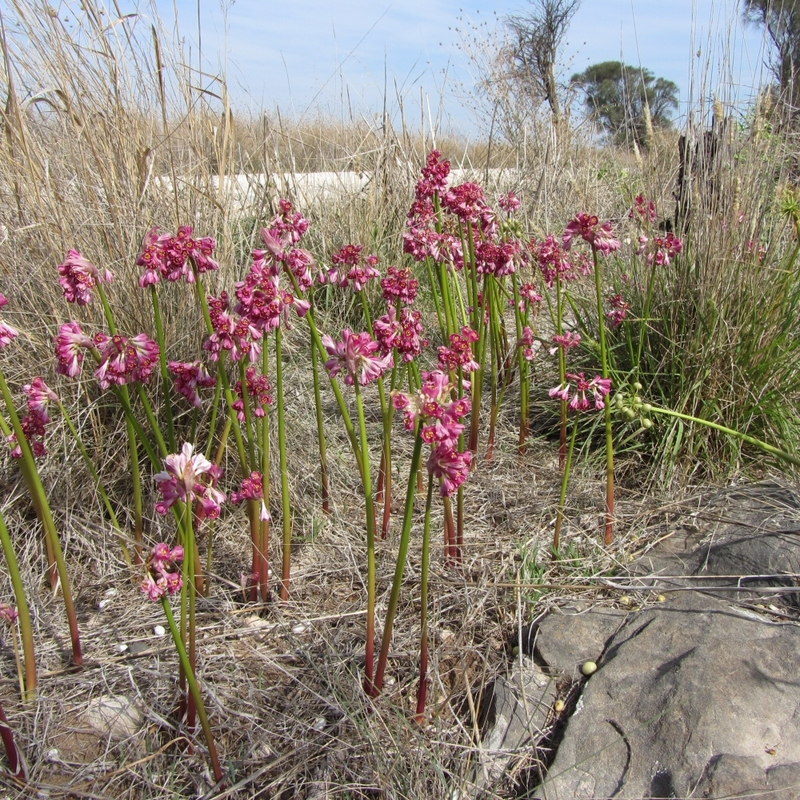 It is endemic to the Everard Ranges in the Anangu Pitjantjatjara Yankunytjatjara Lands in the north-western region of the State, and was described as a new species by State Herbarium Botanist Peter Lang in 2008. This entry was posted in The Plant Press on 7 March, 2016 by Jürgen.